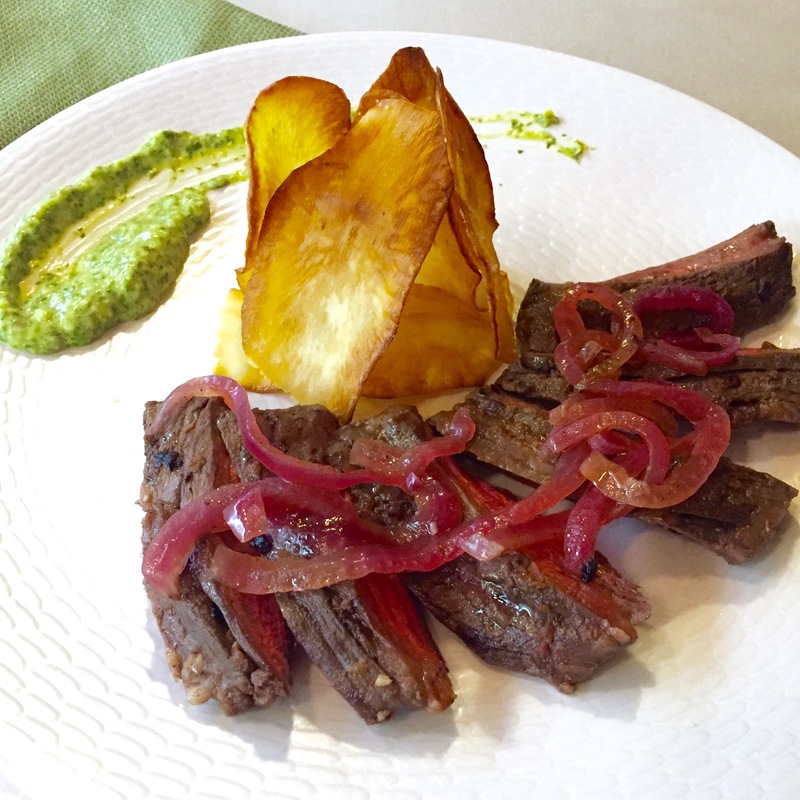 Caribbean Dreams: Churrasco with Pickled Onions, Crispy Yuca Chips, and Creamy Chimichurri – Pao Says, "Open Wide!" I know it’s been a while, guys. In the past few weeks, I’ve been fixing teeth, getting ready for one of my best friends’ wedding, and cooking up a storm… But not having much time to get my culinary creations written down to share. If you want to check out what I cook on a day-to-day basis, check out my Instagram @paosaysopenwide ! So, I found myself missing home the other day. One of my favorite dishes that my mom makes is her Churrasco (skirt steak) with chimichurri (I’d describe this as a Hispanic version of pesto) . Naturally, as I’ve suggested before, the best cure for nostalgia … Or anything, really, for that matter… Is food. So I made my mom’s Churrasco and I put a twist on her classic chimichurri by making it creamy with the addition of some avocado and a touch of mayo. After making this sauce, I proceeded to put it on the Churrasco steak, I dipped my crispy yuca chips in it, I threw it on top of eggs in the morning, I dipped fried chicken into it… Hell, I took a spoon to it at some points. It’s bomb, and super versatile, so I’m sure you can find even more uses for it. If you make this or any of my dishes, please #paosaysopenwide or Instagram or Twitter! I would love to see how you guys are interpreting these recipes and making them your own! Combine the garlic, smoked paprika, apple cider vinegar, 1 tsp salt ,and red pepper flakes with the olive oil. Pour marinade over the churrasco steak. as the steak marinades, slice up the red onion and put it into a pan over medium heat with the rice wine vinegar, the pinch of sugar, and the pinch of salt. Cover and let them cook for about 5 minutes until they become bright pink and slightly translucent… you will notice the vinegar almost completely evaporate. Once your onions are bright, set them aside. Heat enough vegetable oil to fill about 1/2 inch of a cast iron for your yuca. Cut the tough brown outer skin off of the yuca. Slice your yuca on a mandolin (I like a little body to my chips, so I slice on the 2nd or 3rd setting- not the thinnest). Fry the chips in the oil until golden, then take out of oil and set aside on a plate with a paper towel on it to drain the excess oil. Salt these chips immediately =y so the seasoning sticks to the hot oil/chips. Combine all of the chimichurri ingredients in a food processor and just let it ride. Carefully pour out the oil from your cast iron, and bring it back to the heat. 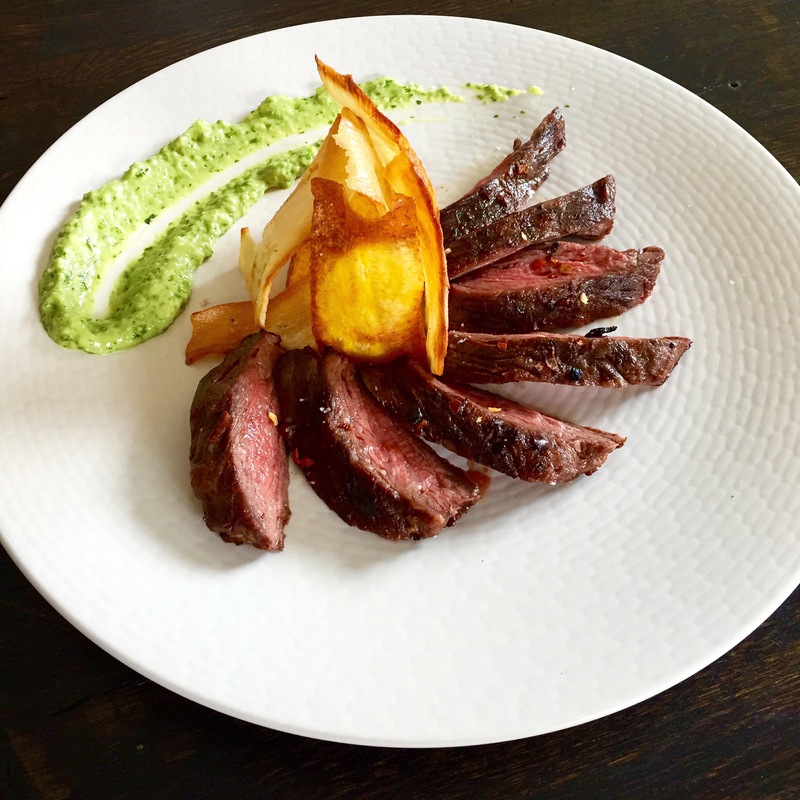 cook your churrasco once the pan is hot again. I cooked mine over med-hi for 2 minutes to one side, and 1 min and 30 seconds to the other side. Take it off the heat and let it rest for 5 minutes or so. Then, slice the churrasco to serve!